Just regular folks. : Change is in the air. We went a week without childcare and survived. Since I work from home, I often toy with the idea that perhaps we do not need to hire childcare as it is a large expense of ours and I would love to spend the money to replace thread-bare and stained sofas (which are starting to be an embarrassment when pals come over) and paint the house (which is still contractor white) and a nice beautiful leather purse. But it usually takes only a week of juggling, getting less sleep, calling in favors, being behind on work and cancelling appointments to convince me that, indeed, childcare is money well spent. It just that Vince is quickly approaching the age where he does not need very much supervision - while Edda still very much does. I spent the morning filling out a form called the Vineland Adaptive Behavior Test for Edda because she needs to be categorized within the school system. Pages and pages of check marks indicating the severity of her disability. No, she cannot point to three major body parts when asked, nor does she tell lies nor does she hold a part time job. I don't really no what the point of this test is - but dutifully I fill it out. 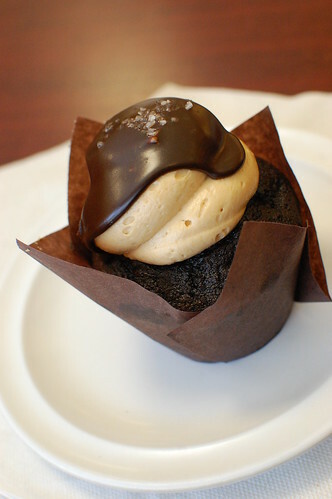 Of course, I am not really doing well on my quest to lose 5 pounds - here is an exquisite caramel/chocolate/sea salt cupcake I ate on a girl's lunch out last week. Yum! A nice beautiful leather purse. Now that is a good goal to shoot for! Edda needs your help which is what the childcare is, you helping Edda. And, it frees you up for the time that is fast approaching that Vince is going to need from you during Jr. High and High school. You are doing a great job.